Behind My Red Door: Whatcha Working On Wednesday? Happy Wednesday soggy friends!! Are you soggy? We sure were here Behind My Red Door! It is sunny, not too warm and just beautiful today after a VERY wet Tuesday. Probably more importantly we did get 3 absolutely perfect days over the long weekend. Saturday, Sunday and Monday were dry, nice temps in the mid 70's, the sky was blue with fluffy white clouds and there were wonderful light breezes. We did errands, worked outside and got the yard and gardens in shape again, had some wonderful family time and a cookout, and DH got some golfing in and I got some deck time in and finished two books I had gotten months ago. It does not get any better than that in the summer. And the best part of course was that DH and I had some great snuggle time with Liliana and that is now my favorite activity. But since I can't hold her 24/7, it's time to get back into crafting and creating. So I decided to join Leslie and yes, I really am going to post something I am working on - finally! I know, I know, it has been a loooong time since I have joined you all on a Wednesday. My long time followers probably remember waaaaay back when I had something to post about every Wednesday it seems. Really - I did!! Yes, I actually picked up a needle and floss, or dough, or paper and glue and made things! I know, it is hard to believe. To prove I really can make things and mostly because I REALLY need to inspire myself to get busy creating again, I decided to post pictures of just some of things I worked on in the last year. I really am not a slacker - really!! After all, I did finish two books this week! Of course you all know by now that I LOVE LOVE LOVE fall. I decorate as much for fall as I do for Christmas. And even though our home was in Mercantile Gatherings this spring, originally Twigs had asked me if our home could be in the Fall 09 issue. That meant photo's had to be taken last fall. So I really outdid myself if I do say so myself. Later Twigs asked me to if I could take pictures of our home for spring, so the fall pictures never made it into print. You can see them if you click here! I decorated a bit early and was inspired to stitch up storm. 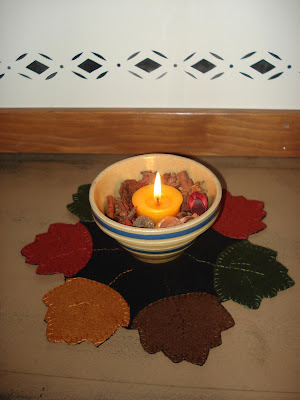 And this wool leaf candle mat made from a pattern from Create and Decorate magazine, October 06 issue I believe. 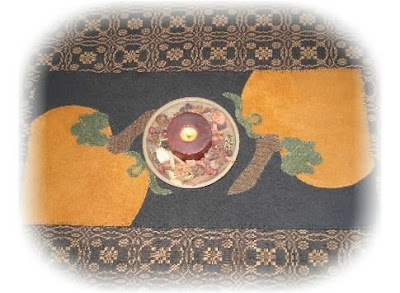 And this pumpkin table runner - again wool. 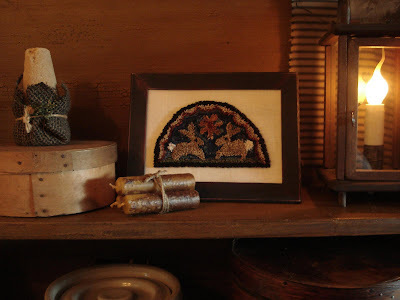 This is a Lake View Primitives pattern. 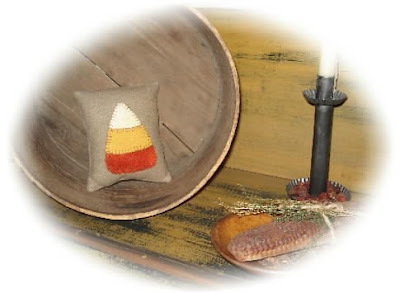 And this wool candy corn pillow... again, my own pattern. 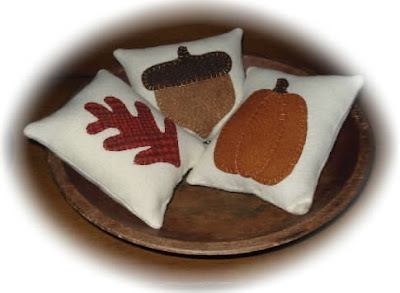 And the white pumpkin wool pillow - my own design again. 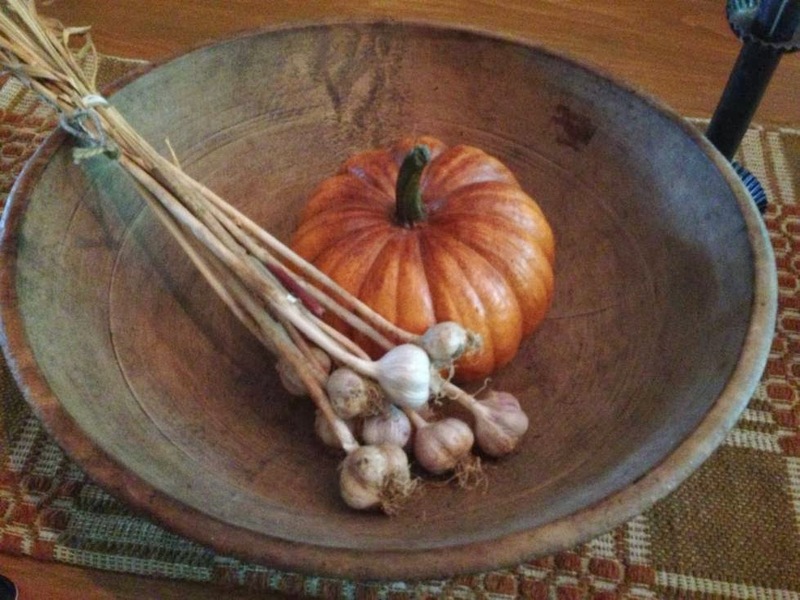 And then to get ready for Christmas decorating, I made up these ornamental ginger boys using a recipe I saw on Colleen's And Baby Makes Five blog way back in the fall. Click on her blog name for the recipe! 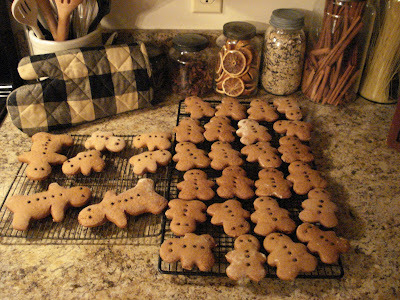 Most of them went on this Swedish Cookie Tree DH made me in 1985 from a photo I saw in Country Living back then. 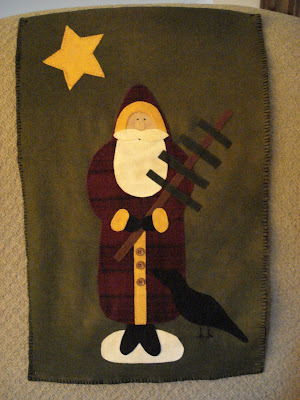 And then after a trip to Sturbridge to the former Primitive Cellar, I had to come home with the wool and pattern for this wall hanging. 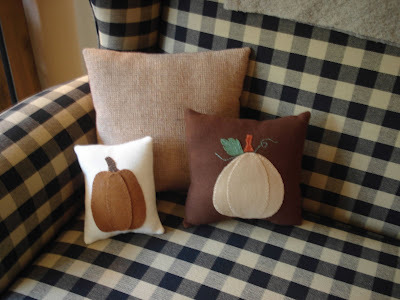 I also bought the pumpkin runner pattern above at the former Primitive Cellar. Doreen now has her shop in the historic Walker Homestead. I attended the open house and you can read all about it here. I hung this here and to see the rest of our Christmas 08 decor, you can click here. After the holidays, I got inspired to change the display in the cubbies of my long red shelf in the living room. I already had the crow pillow so I decided to make some more wool pillows and wool rag balls to join them. All the other pillows were inspired by patterns I didn't have so I printed out photo's and traced them to make my own patterns. 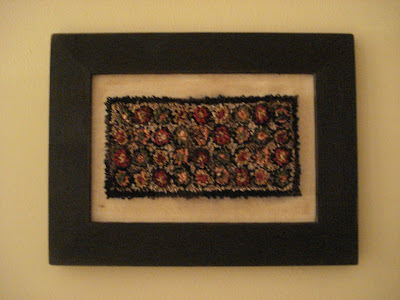 And made this needle punch picture from a Primitive Betty's pattern. 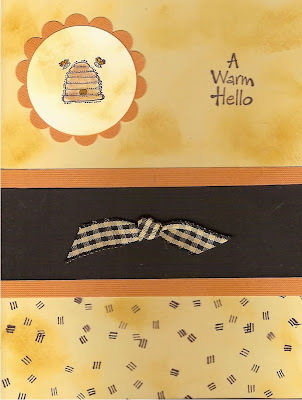 Betty very generously shares many patterns with us! 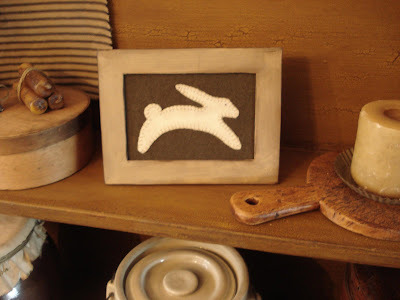 And this is another punch needle I made in the spring. This is called Penny Rug and is a Hooked On Rugs Pattern. I decided I needed some new late summer decor. I know it isn't late summer yet, but maybe if I start NOW I will be ready when it really is late summer! And what could be more late summer than sunflowers and crows?? 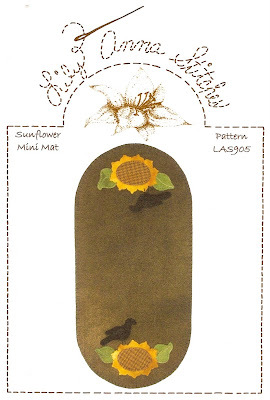 I decided to use the crow and sunflower from this Sunflower Mini Mat pattern LAS905 by Lily Anna Stitches. Don't you just love the name Lily Anna? No Liliana isn't pronounced quite the same but it is close! Sorry, there is no website given on the pattern but the there is an email address: lorikabat@charter.net. Instead of a mini mat, I am making it into a pillow. 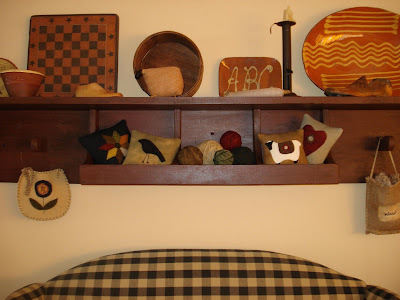 I love small pillows to tuck in here and there each season. So far I have gotten as far as tracing and cutting out the wool pieces and ironing them on the pillow front. When I get off the computer, I am going to get stitching so that next week, I have a finished project to share and maybe even another. Make sure to check back then! One gal who is definitely not a slacker, whether she is making Ornamental Gingerbread or sharing yummy edible recipes or stitching up a storm or caring for her three adorable kiddo's, is my friend Colleen. She surprised me with this adorable new stitchery!! "Whenever a child is born, so is a grandmother". Isn't that perfect?!! I was so delighted to learn the kiddos helped pick out the design. Do you see the daisies? My favorite flowers! 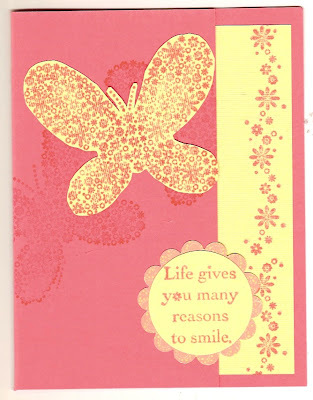 And the lilac butterfly? Just like in Liliana's nursery! Didn't they do a great job picking out the pattern? And Colleen did a great job putting it all together for me. Thank you so much Colleen - this now has a place of honor in my office!! In fact, it was the perfect inspiration for me to tweak my office decor a bit and so I spent some time doing that yesterday. I'll have some pics to share later this week - I hope. These days I am keeping my schedule loose so no promises! And before I forget... if you haven't seen the newest homes in the Member's Gallery of A Primitive Place, you really should stop by. 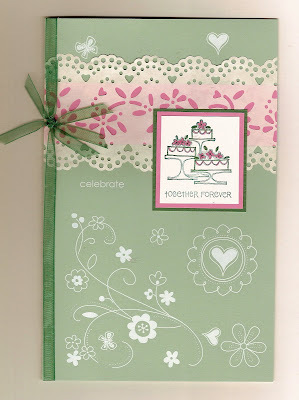 Some of our favorite blogging friends have recently added their homes and some gals not in blogland as well. 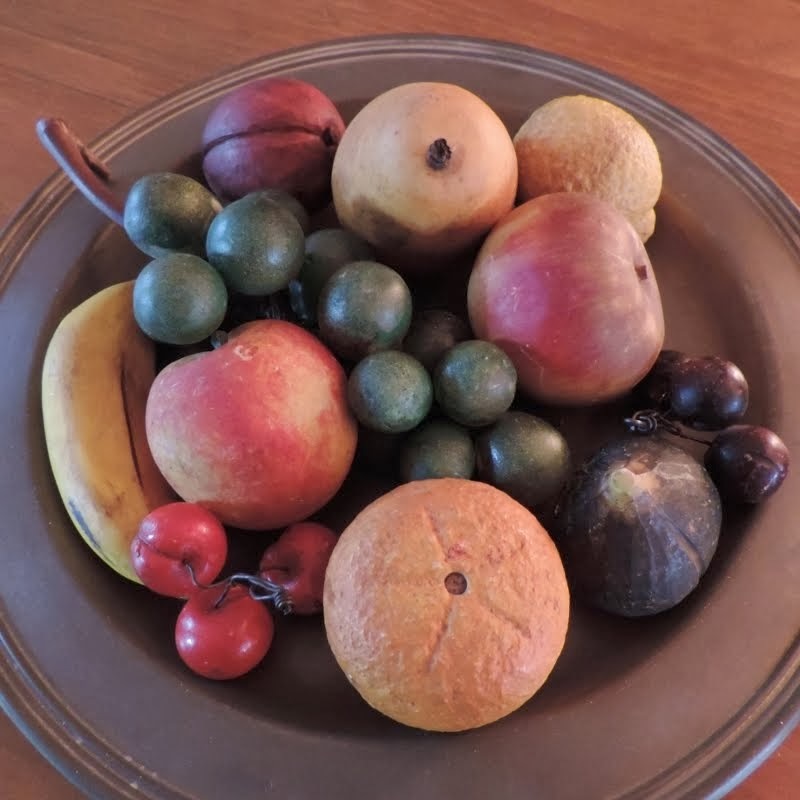 Kristine has done an amazing job creating a place for us to share our love for all the different styles of prim, colonial and country decor. I hope summer is being good to you all. Thank you for stopping by and visiting my little corner of the world Behind My Red Door.